27-Aug-2001 -- To get to this confluence I used a Garmin eTrex handheld GPS. We happen to have a summer house in Alsóörs some 2.5 km away from the 47N 18E confluence. Alsóörs actually is a great holyday spot of Hungary by the famous lake Balaton on its north coast, 120 km away from Budapest. First I started my hunt by car following the pointer of my GPS. It showed that I would have to drive along the coast of the lake. As I followed the sign I got to a spot where I had to leave the car and walk across some lands straight toward the lake. At this point I was about 180 m away from the confluence. I took the first pictures from there. As I crossed the main road and the rails, I realized that I was still short with more than 100 m, but I could not walk into the reeds. I figured out that I would have to approach the spot from the water. I went back to our house, left the car there, and went down to the beach. There were a rather big variety of different water-vehicles to hire, but since the distance was still 2 km from the beach, there was no wind at all to sail (it is not allowed to use motorboats on Balaton), and the digicam was not water proof, I chose a water-bike. Together with my mum we got to the confluence by 20 minutes of riding this rather awful machine. Unfortunately the spot seemed to be inside the reeds. 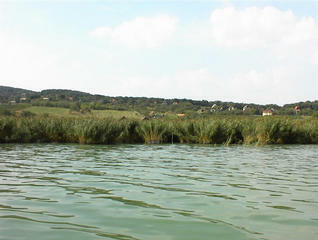 Since this water-bike was relatively wide, we had big difficulties getting into the more and more dense group of reeds. We could approach the confluence to 32 meters where I took some pictures of the reeds around. Even from this place it took ten minutes of horrible muddling to get out to the free water. I took some pictures from there as well. After finishing this great job I jumped into the water to cool myself down. With 10 minutes of delay we brought back the water-bike, which we hired for one hour, but the guy there really did not care. He was glad that some people took his machine off-season for a rather rip-off price of about 4 dollars.